What Is So Important About TV Resolution? What Are the Features of the Hisense 32H3B1? The Hisense 32H3B1 is a basic entrant into the HD TV pool. Its simple design and features make it easy to operate out of the box. The multiple input modes make it great for game rooms or bedrooms with game consoles and DVD players. Quality sound and a decent picture make it a good contender at a low price. Spending time looking for a new TV can be exhausting. Not only that, but sometimes it also seems like you'll have to pay a ton of money you don't have. Things like 4K and screen refresh rates are terms you don't understand and really don't want to. You want a decent TV at a low price. You don't want to waste your money on something that will break in five days. Enter the Hisense 32H3B1. It is a basic HD television at a great price, which may give you exactly what you're seeking. At present, there seems to be an endless number of options when it comes to TVs. The highest resolution or picture quality available at the time of writing was 4K, which enables viewers to see double the amount of colors or pixels as the next-best option, which is 1080. 4K is considered ultra-high-definition TV, and depending on refresh rate, can give you too much detail, resulting in picture instability. 1080 is the next step down from 4K and is the most common resolution. It provides the viewer with a significant level of detail without the shake, and the color balance between black and white is super sharp. Colors are vivid, and Blu-Ray movies and high-definition video games are often best played in this setting. The final step down is 720 resolution, which is the entry level of the high-definition television. It gives sufficient color and clarity, but the picture is less than stellar, as colors aren't vivid. The Hisense 32H3B1 is at this level. The Hisense 32H3B1 is a basic HD TV with a decent picture quality for the price. It has a 720p high-definition resolution, which means it won't be the most detailed picture, but it will be good enough to enjoy your favorite show or a movie. The screen isn't too dark or too bright, which can be a problem with a 720 resolution TV. In fact, the light balance is pretty good. While a particularly dark scene in a movie or show will appear even darker and you may miss some of the detail, you won't miss much. The lack of motion compensation may give you a less-then-decent picture on your television when it comes to sporting events or high-action scenes. The Hisense 32H3B1 also doesn't connect to the internet like most of its contemporaries. These smart TVs connect directly to the internet via your in-home WiFi to allow users to surf Netflix or Amazon Prime offerings. In this way, the Hisense 32H3B1 is considered a "dumb" TV. There are two other versions of the Hisense 32H3B1 that are more sophisticated, the 40 and 50-inch versions. Both of these do offer 1080 HD quality resolution. You can watch most things and enjoy most games with a 720p resolution. Your kids might complain that some of their video games aren't as clear, and they may be dark, but you can manually change the settings on the Hisense 32H3B1 to brighten it up a bit for pickier viewers. The level of shadows and dark space that show up on the screen are relatively high, which means higher contrast and denser coloring in shows and movies. At this price, one would expect the black levels to be more dull and gray. However, in testing, this turned out not to be the case. The Hisense 32H3B1 is not the fanciest of televisions, which may be the reason you end up purchasing it. Out of the box, there are no unnecessary or overly time-consuming setup and picture adjustments. The white and black balance is already at a reasonable level, and nothing should look so off that you have to adjust the brightness. You may want to make changes according to your personal preferences, though. Depending on its placement in your home, the TV picture may need to be adjusted (things like direct sunlight can affect how well you can see the TV picture). However, in general, and for the purpose of this review, the TV is good to go at the outset. There are also component hookups for those devices that aren't HDMI-ready, like older gaming systems or DVD players. You can also hook up a sound system via the components or the optical audio slot. As televisions have gotten bigger, their footprints have gotten smaller. More and more companies are making razor-thin TV sets that are lighter and give you a full picture, but they've lost a prominent feature along the way: sound. The bigger TVs have gotten, the harder they are to hear. This is due, in large part, to the shrinking space for speakers. As a result, manufacturers have installed smaller speakers with a fraction of the audio quality. The Hisense 32H3B1 does not suffer from this same fate. While it never hurts to have an external sound bar or sound system if that is something you want, you won't need it with this unit. The black and white balance is above average for a TV at this price point. However, the rest of the color saturation is quite underwhelming. This equates to less-than-vivid reds and blues. It may appear that your favorite actors are wearing pastels instead of bright colors. Most TVs have at least two choices when it comes to picture resolution, 1080 or 720. The 4K TVs that have been flooding the market (and draining bank accounts) offer an even higher picture quality than 1080. The Hisense 32H3B1 is a one-track TV. There is no switching between resolution options to see which garners the best picture. 720p is your only option if you want to watch this TV. As you and your family gather around a TV to watch a movie or sporting event, you can't all be in the dead center of the picture. Those on the sides don't miss too much with higher resolution televisions. However, in the case of the Hisense 32H3B1, there will be a marked difference in viewing the TV from the center versus the outer sides. This anomaly is due to the fewer pixels offered at 720p resolution. Therefore, if you're looking for a TV everyone can watch equally well, you may have to upgrade to another model or at the very least to a larger version of this model, which gives you a bigger picture and 1080 quality. The faster the refresh rate, the better your TV will be able to keep up with high-definition shows and movies. Lower refresh rates mean live sporting events may have a lag or freeze time, as will Blue-Ray quality movies. The lower refresh rate makes it impossible for the Hisense 32H3B1 to keep up with the quick action and movements of some of these higher-definition events. The price of the Hisense 32H3B1 is one of its best-selling features. The 32-inch TV reviewed here will set you back between $129 and $179 depending on where you purchase it. The Hisense 32H3B1 can be purchased online through Amazon and Walmart. You may also be able to find it in stores like Target and Best Buy, but you should call ahead to see if they have them in stock. As with most things, the Hisense 32H3B1 has its good and not-so-good features. We've already mentioned some of these in our overview above; however, we've broken it down further to make it easier to refer back to when you decide to shop. We’ve also done some comparison between the Hisense 32H3B1 and the other brands reviewed above. Compared with the other brands mentioned above, the Hisense 32H3B1 has a leg up with respect to some of its features and options. First and perhaps foremost is the price. 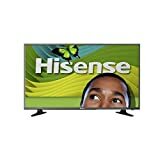 While there are inexpensive televisions on the market, none offer the quality of sound and picture that the Hisense 32H3B1 does for the price. The inclusion of three HDMI ports was far beyond the other options we were able to find. The sound quality was high, as was the resolution and color balance at this price point. While the basics the Hisense 32H3B1 has to offer are sufficient, there are some things that it lacks when comparing it to other TVs in this price range. The Hisense 32H3B1 lacks pixels, which makes images appear less bright, especially when viewed at an angle. Therefore, it is not the best TV for your living room. It makes a great option for an extra bedroom or game room. The colors of some of the other brands were much brighter than the Hisense. While balance was more than adequate, the overall brightness was relatively low. Finally, one of the most important things you may want to watch on your TV is live events. Sports or concerts may have an apparent lag time and then get caught up because the refresh rate is not as fast on the Hisense. In contrast, the Toshiba is the better choice when it comes to this, as its refresh rate is quicker to keep the picture from freezing. Overall brightness was relatively low. If you want to invest a little bit of money to get a nice TV with a decent picture quality, the Hisense 32H3B1 will work for those needs. Its entry-level HD resolution and internal sound are better than expected at this price point. While it won't allow you to view things with crystal clarity all the time, it will enable you to enjoy a movie or TV show while staying within a modest budget. The Hisense 32H3B1 is an inexpensive television that offers great video quality to boost entertainment experience. However, some images in this model may appear less bright because its overall brightness is relatively low.